Pork is one of the easiest meats to cook. It's extra lean and can be seasoned in countless ways. One great way to prepare pork is it in a roasting pan, regardless of whether it will be cooked in the oven or on a stove top. Cooking pork in a roasting pan gives you several options for ensuring that the meat remains juicy and flavorful, just follow these easy steps. Preheat your oven to 350 degrees. Put herbs, peeled cloves of garlic, olive oil, butter and 1/2 tsp. each salt and pepper in a food processor or blender. Pulse until herbs and garlic cloves are chopped fine and ingredients are combined. If you don’t have a food processor or blender, finely chop herbs and garlic, soften butter and mix ingredients. Place a cooking rack in the bottom of a roasting pan to elevate the pork. If you don’t have a cooking rack, make two or three “logs” of aluminum foil and lay them across the bottom of the pan. This will create a support and elevate the roast from the bottom of the pan and prevent "boiling the roast." The meat will cook more evenly and allow the herb mixture to remain on the roast rather than being removed by the liquid. Chop and dice sweet onion. Rinse and slice mushrooms. Put onions and mushrooms in the bottom of the roasting pan. Pour 2 cups of white wine, beer or apple juice in the pan. Rub the pork with your herb mixture, making sure it is evenly coated on all sides. 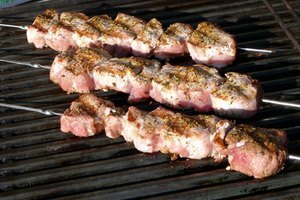 Place the pork loin on the aluminum logs or cooking rack. Place roast pan on middle rack of hot oven and leave oven set on preheat 15 minutes. Turn to normal bake setting. This will help sear the roast, making it juicier and bringing out the flavor of the herb coating. 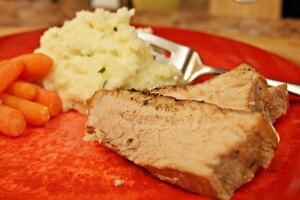 Baste pork loin with pan juices after 30 minutes and baste again every 15 minutes. Cook pork 20 minutes per pound or until the pork reaches an inside temperature of 160 degrees. When you take the roast out of the oven, cover with foil and let it rest 10 to 15 minutes. This will allow the meat to relax and tenderize, as well as keep the juices inside. If you’re using apple juice instead of beer or white wine, add apple wedges to the pan for extra flavor. After baking, transfer the liquid out of the pan into a sauce pan and reduce it by heating it on the stove top. This will concentrate the flavors of the natural juices. 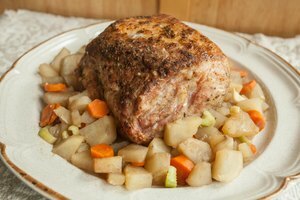 You may use any of your favorite spices or flavorings on the pork, including a honey and brown sugar crust. Serve with your favorite side dishes. 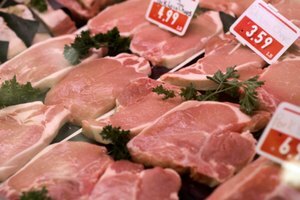 Make sure any meat, chicken or pork is cooked to proper temperature to kill all bacteria. Wash your hands with hot water and antibacterial soap after handling raw meats, fish or poultry, and wash any utensils and cutting boards that come into contact with raw meats or poultry.